When Bruce Wayne is “assassinated” by Batman, he lets the world think he’s dead and goes in search of the Batman imposter. Meanwhile, Harvey Dent increases his war against the caped crusader in the run up to the mayoral election. While Hero may have been a fantastic episode, Epitaph blows it out of the water. As we get closer to the end of the series tension is mounted by Batman becoming a true outsider. While Batman has been shown to be outside the law for the entire series, in Epitaph he is shown to be on his own with even Gordon turning against him. By adding this extra danger to our main character it means the audience feel doubly interested in what will happen and how Batman will be able to get out of the situation he is in. Another thing Epitaph does better than Hero is that there is an actual mystery involved in this story and we get to see The Dark Knight prove his credentials as the world’s greatest detective. Many times throughout the series and throughout Batman’s history, writers forget that his stories are in essence detective stories but Epitaph firmly puts the mystery of the identity of the imposter in Batman. This plus the tension building up around Batman’s new terrorist status means that the episode speeds along nicely not daring to stop for a moment. 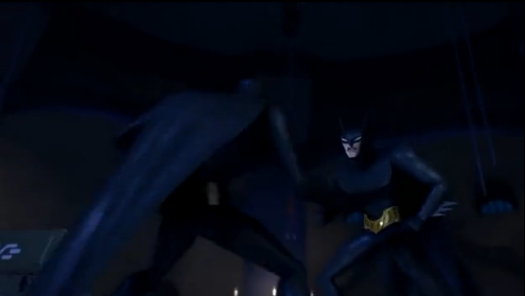 This could have been a bad thing but luckily the makers of Beware The Batman know how to make the episode feel swift and energetic but still pace it so that the audience don’t miss anything. Epitaph also manages to give a genuine surprise to the episode, that Dane Lisslow, a previously likeable character and friend of Wayne’s, is trying to frame Batman and kill Wayne but is also working for Deathstroke. The way this is dealt with is subtle and also shows off Batman’s detective skills as he is able to deduce Lisslow is the other Batman by comparing shoe prints and fighting styles. Beware The Batman knows how to tease the audience as we don’t get a full explanation for Lisslow’s actions until the next episode. The episode ends on a cliff-hanger with Batman now being blamed for Dane Lisslow’s apparent death and Dent suffering severe injuries. It becomes apparent to the team that Dane Lisslow doesn’t exist which sparks further questions that leave the audience expectations high for the next episode. Epitaph leaves you craving more but it is a good story in its own right when it plays with the idea of how Batman can work well against a copycat version of himself. With a mixture of original plot, great action and suspense Epitaph proves itself to be one of the best Beware The Batman stories to date.